(Reuters) - Warren Buffett is paying a hefty price for the biggest bet of his career as his Berkshire Hathaway Inc (BRKa.N) has agreed to buy Precision Castparts Corp (PCP.N), valuing the maker of aerospace and other parts at $32.3 billion. The purchase is Berkshire's largest, and accelerates its transformation from a company largely dependent on insurance businesses into one resembling the broader U.S. economy, including a railroad, several industrial companies, utilities, a car dealership and consumer goods businesses. Berkshire has said it owned 3 percent of Precision Castparts prior to Monday's takeover. Precision Castparts earned $1.53 billion in its latest fiscal year. "I'm not crazy about paying $30 billion for a $1.5 billion earnings stream of a cyclical company supplying airplane makers," said Jeff Matthews, a principal at hedge fund Ram Partners and author of a book about Buffett. "I'd keep the $30 billion and wait for the next crisis." "This is a very high multiple for us to pay," he told CNBC television. Berkshire is paying $235 per share for Precision Castparts, which represents a 21.2 percent premium over Friday's closing price, and 17.5 times projected 12-month profit. It valued Precision Castparts at $37.2 billion including debt. The merger eclipses Omaha, Nebraska-based Berkshire's $26.5 billion purchase in 2010 of the 77.4 percent of the Burlington Northern Santa Fe railroad that it did not already own. In afternoon trading, Precision Castparts shares rose $37.13, or 19.2 percent, to $231.01. Berkshire's Class A shares fell $522.76, or 0.2 percent, to $214,940. 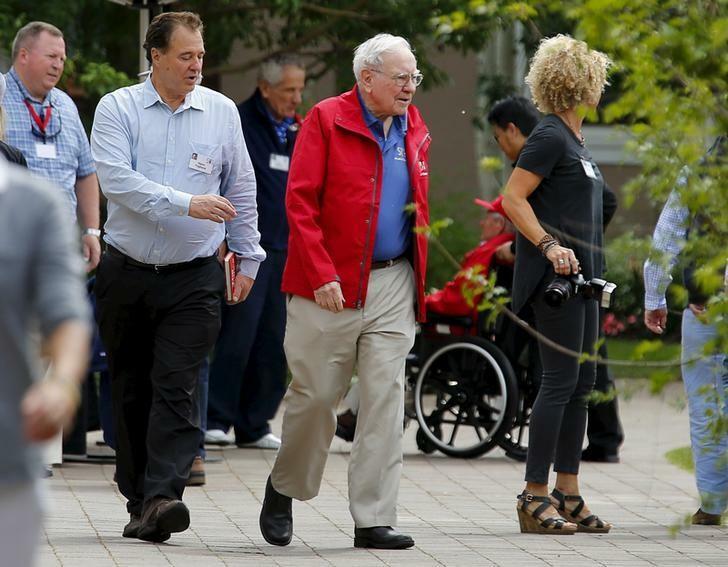 The latest purchase shows how hard it is to move the needle at Berkshire, whose own stock has lagged the Standard & Poor's 500 in the last five years and which on Friday posted quarterly operating profit well below analyst forecasts. Adding Precision Castparts would boost Berkshire's overall operating profit by less than 10 percent. Todd Combs, one of Buffett's investment managers, had begun buying Precision Castparts shares in 2012. "You've got to give credit to Todd Combs for this deal," said Buffett, who turns 85 on August 30. Buffett has run Berkshire since 1965. But the Portland, Oregon-based company also makes parts for the energy industry, which has struggled as oil prices (LCOc1) (CLc1) have fallen by more than half over the last year. Prior to Monday, Precision Castparts' shares had fallen 20 percent in 2015, and the purchase price is below the shares' 52-week high of $249.05 set last September. Even so, analysts said Berkshire is paying more than 12 times trailing earnings before interest, taxes, depreciation and amortization. That's above the 9 multiple for BNSF, which now generates more than one-fifth of Berkshire's operating profit. "At the time of his Burlington Northern deal, everyone criticized he paid too high a price," said Ken Shubin Stein, founder of Spencer Capital Management in New York. "We see a unique alignment between Warren's management and investment philosophy and how we manage PCC for the long term," Chief Executive Mark Donegan said in a statement. Andrew Carolus, managing director at Mesirow Financial Investment Banking in Chicago, said Buffett is "obviously a believer" in Precision Castparts' prospects "over the next five to six decades." Brian Reynolds, chief market strategist at New Albion Partners in New York, added that having access to Berkshire's balance sheet could help Precision Castparts do more dealmaking, "which the management has proven they're good at." Other industrial companies that Buffett has bought in the last decade include toolmaker Iscar, parts maker Marmon, and speciality chemicals company Lubrizol. While that would leave Berkshire with more than $40 billion of cash, twice the cushion Buffett wants, Buffett said it would be at least a year before he could pursue another "elephant" sized transaction.